Your cat’s liver, biliary system and digestive processes function together to keep him healthy, making it difficult to tell what the problem may be if one system breaks down. Fatty liver disease and triaditis produce similar symptoms in some cases, but they’re ultimately two completely separate disorders. You may know it as fatty liver disease, or you may have heard it called by its other name -- hepatic lipidosis. Either way, it's bad news for your kitty. The liver is an important organ that keeps your cat alive. It's responsible for metabolizing fat, carbohydrates and proteins; it produces substances for blood clotting and it filters nasty substances from the blood. When hepatic lipidosis is an issue, too much fat piles up in the liver's cells, and that fat keeps the liver from working efficiently or, in some cases, at all. Unlike fatty liver disease, triaditis doesn’t affect just one organ. It’s a combo disorder that occurs when kitty has irritable bowel disease (IBD), problems with the biliary system and pancreatitis. IBD, as its name suggests, causes stomach troubles. Inflammatory white blood cells respond inappropriately to the normal contents of the kitty's stomach or intestines. A healthy cat's wee body contains a complex system of ducts that carries bile from the liver to the gallbladder, and then to the intestines. Biliary disorders occur when that system breaks down. The pancreas secretes insulin and pancreatic enzymes to aid in digestion, among other things. The same enzymes that should aid the cat turn on the pancreas and begin breaking it down. Unfortunately, veterinarians don't quite know what causes fatty liver disease yet, though they believe being overweight increases Kitty's odds of acquiring the problem. With triaditis, cats with any one disorder in the trifecta are more likely to suffer the others. Surgery on the intestines, being fed a poor diet and infections lead to pancreatitis. Like fatty liver disease, IBD's cause has yet to be determined by those in the know, or not in the know, as the case may be. Fatty liver disease manifests itself in some alarming ways, like extreme lack of appetite, a yellow cast to the kitty's eyes, lethargy, seizures, vomiting and drooling. It sometimes causes the kitty to look as though he's wasting away, due to muscle loss. Triaditis manifests itself in similar ways, but brings with it additional issues, like diarrhea, gas and straining in the litter box to produce stool with blood or mucus. Rather than losing his appetite, it's possible he could become unusually hungry, and watch out for fevers. For triaditis, immune-suppressing medications, antibiotics, surgery, intravenous fluids, withholding food and water, and medicationss to fight inflammation may help.The treatment for hepatic lipidosis depends on how the disease manifests itself. A sick kitty may need a blood transfusion, and medication to increase his appetite and to lessen nausea. Long-term, the sick kitty will need a special diet to control his condition. Only a veterinarian can devise an appropriate plan for treating these illnesses, so make an appointment ASAP if your cat shows any signs of illness. Always consult an experienced veterinarian regarding the health and treatment of your pet. What Happens When a Yorkie Dog Has Liver Problems? 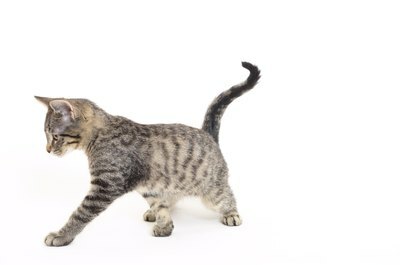 What Causes Fatty Liver Disease in Cats?